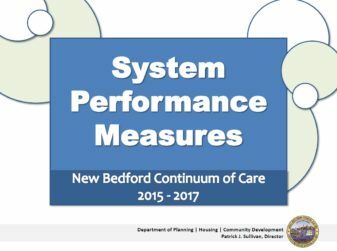 The City of New Bedford’s Continuum of Care (CoC) uses system performance measures developed by the U.S. Department of Housing & Urban Development (HUD) to assess how well it is moving toward ending homelessness within the CoC, itself. By looking at a series of data produced by the Homeless Management Information System (HMIS), an aggregate look into the performance of certain metrics from 2015 – 2017 provides insight as to some strengths of the CoC as well as areas that may be targeted for improvement. Take a look at the System Performance Measures Powerpoint for data highlights released July 19, 2018.